Lately, I've been experiencing a lot of nostalgia for DC. It sounds weird to say, because we're still here and don't plan on leaving soon, but I love DC. It's taken me a long time to find a place I felt comfortable calling home and DC is definitely it. This city takes my breath away and there is no time like during the Cherry Blossom Festival to prove why. My mom came to town this weekend and The Pilot and I loved showing her around the Cherry Blossoms and taking her to some of our favorite neighborhoods while trying out some new restaurants. Usually, when my mom comes to DC, I like taking her to my favorite places, but this weekend, we tried a ton of new things and it just made me fall in love with the city even more. Friday night, I met up with two of my book club friends to see the Synetic Theater's silent production of "Romeo & Juliet." Synetic has been doing silent renditions of Shakespeare plays for years and this was my second play by them. They do a phenomenal job and I highly recommend a trip to Synetic for anyone who loves theater and is coming to DC! Trust me, I doubted the idea of silent Shakespeare too; it's well worth it! I woke up on Saturday morning and headed for a run around the Mall, where I ran into Courtney and some friends! My mom came in later that morning and The Pilot and I took her to our favorite breakfast spot on the Hill, The Pretzel Bakery, for a quick bite to eat before hopping on the Metro and heading to the Mall to brave the masses of tourists and see the cherry blossoms! For the last week, I've read a dozen articles about how to see the cherry blossoms without the crowds. Let me tell you something. If you want to see the Cherry Blossoms, you have to brave the crowds. Cherry Blossoms are just pretty trees. It's seeing them on the National Mall in front of the monuments that make the Cherry Blossom Festival so famous. It's crowded, yes, but it is 100% worth it. We walked the Tidal Basin and then made our way down to Hain's Point before heading back to the Mall and on to City Center for a round of beers at City Tap House (highly recommend for drinks and snacks but not for brunch!). I made dinner reservations at DBGB, a French-inspired restaurant in City Center which was wonderful! My mom and I shared oysters as an appetizer and we all had fantastic entrees. I was very impressed with the food and wine selection! We opted to skip dessert at DBGB and instead, headed around the corner to Momofuku's Milk Bar which recently opened in DC. I feel like Milk has way more hype in DC than it ever did in New York. The Pilot had the famed "cereal milk" soft serve (which I tasted and thought it tasted like rotted milk), I had crack pie (which is just gooey butter cake), and my mom had Dulce De Leche cake balls (which were just ok). Honestly, I lived around the corner from Milk in New York and went there once after a heavy night of drinking. I thought it was the best thing in the world. My sober, almost 30-year-old-self was not impressed. After a day of walking all over the Mall and eating incredibly filling foods, we were ready to call it a night! Sunday morning, we went to St. Patrick's downtown for Easter Sunday Mass. St. Patrick's is my go-to-church for Lent because it's right downtown and their Mass times are convenient! After Mass, we headed to U Street for dinner at Kapnos, a Greek restaurant (by Top Chef Mike Isabella) that I've been wanting to try for awhile. Unsurprisingly, the food was incredible. We shared a tzatziki spread, some spanakopita (my favorite!) and baklava for dessert on top of very strong coffee and equally strong mimosas! After brunch, we walked off all of our food at Meridian Hill Park at down Embassy Row before hopping on the Metro and heading home. 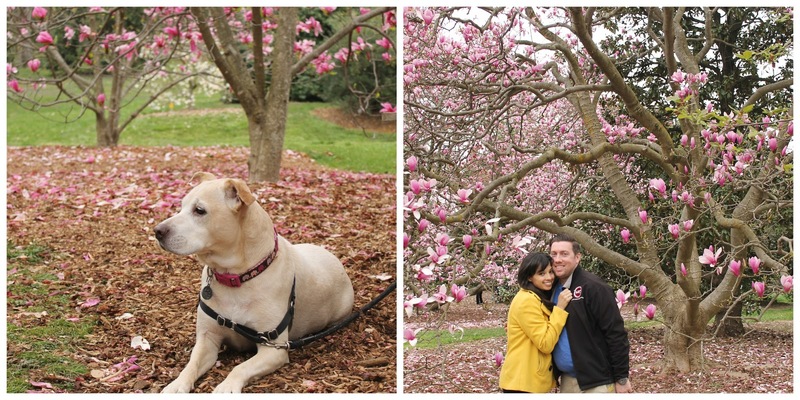 We picked up Peyton and then drove down to the National Arboretum! I hadn't been to the Arboretum yet and honestly thought it was tiny! Turns out, there are 9 miles of running and cycling trails through the grounds which I will definitely be hitting up soon! 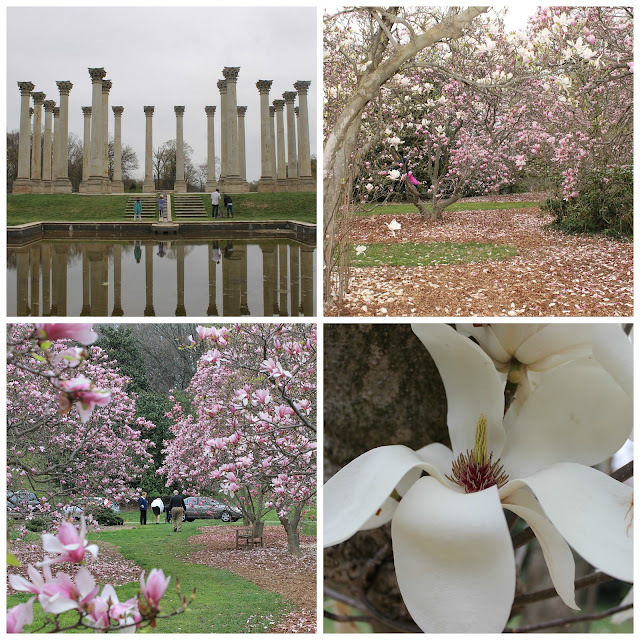 There wasn't too much in season at the Arboretum and it was a pretty cloudy day but the magnolia trees were absolutely stunning! Peyton loved roaming around and smelling all of the smells and sampling all of the different grasses available. We dropped her off at home and then went to Driftwood Kitchen on H Street for dinner. Driftwood Kitchen was another new-to-me restaurant and I immediately became a fan because they have Sunday Happy Hour! The food was fantastic (truffle mac and cheese anyone?) and we shared beignets and a cardamom creme brulee which I will definitely be back for! This weekend was fabulous! 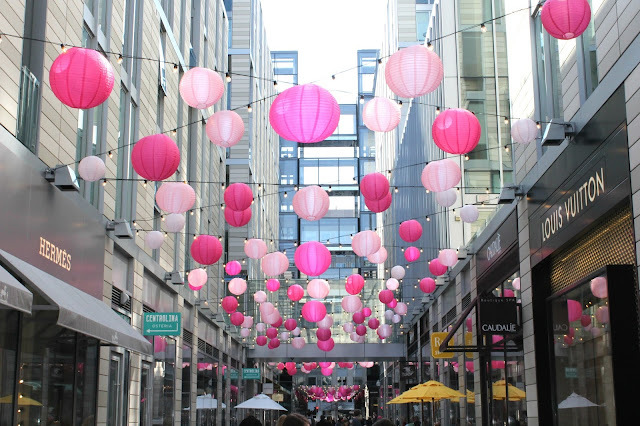 I loved trying new restaurants and showing my mom around some of my favorite areas of DC! 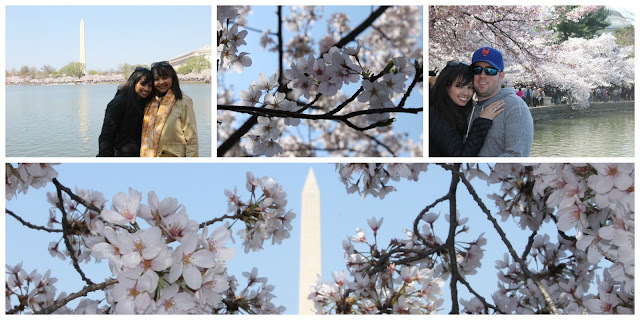 I loved seeing the Cherry Blossoms and falling in love with this city all over again! I love that The Pilot was home and that we go to let Peyton run around what may have been largest open space she's ever been to. I've been so busy lately and so tired and it was so wonderful to have a jam packed weekend with my favorite people doing some pretty awesome things in a pretty wonderful place! 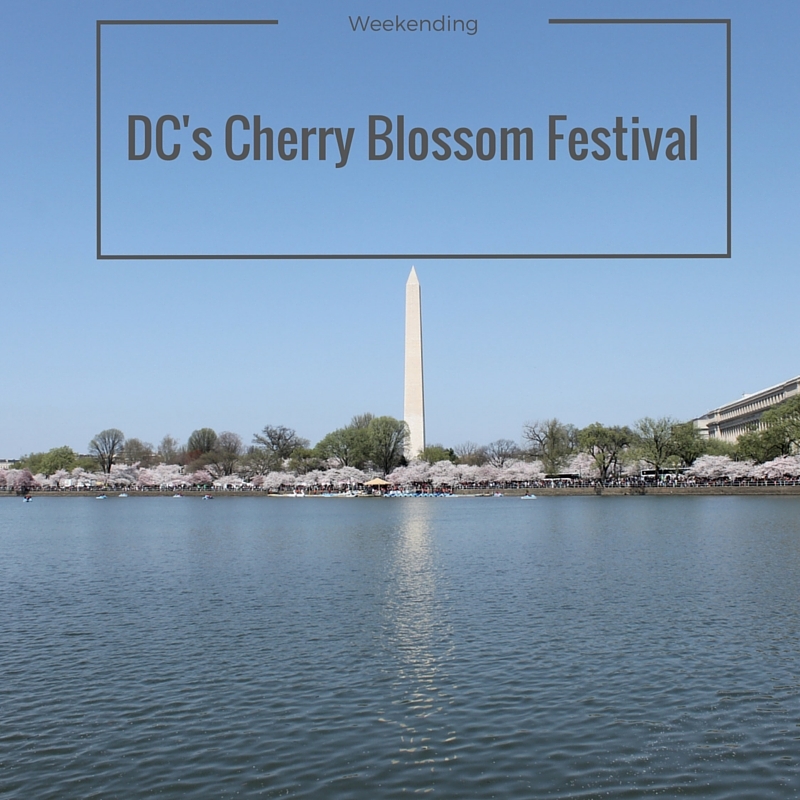 Have you ever seen DC's Cherry Blossoms?